Japan's Butter Shortage Whips Its Cake Makers Into A Frenzy : The Salt For the Japanese, Christmastime means sponge cake. But a nationwide butter shortage has led to mandatory butter rationing, forcing cake bakers to seek out substitutes. A customer picks up a block of butter at a food store in Tokyo on Nov. 10. 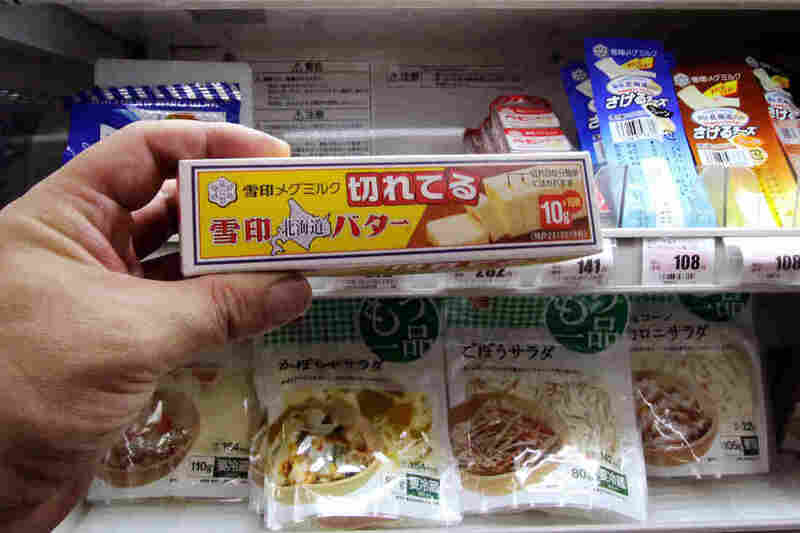 Japanese shoppers are up in arms over a serious butter shortage that has forced Tokyo to resort to emergency imports, as some grocers limit sales to one block per customer. We are well into the Christmas season, and if you live in Japan, that means sponge cake. The traditional Japanese Christmas dish is served with strawberries and cream, and it is rich, thanks to lots and lots of butter. But the Japanese have been using even more butter for their Christmas cakes this year, exacerbating what was already a national butter shortage. 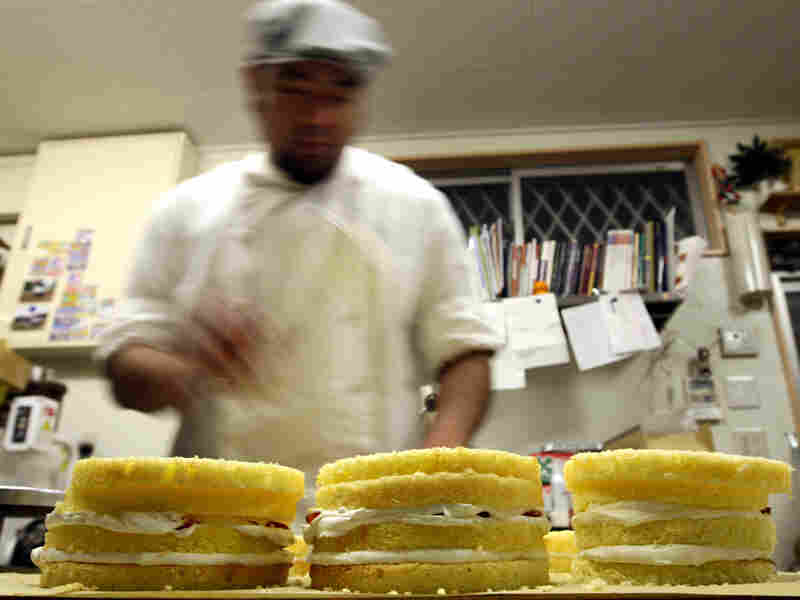 A man prepares a Christmas sponge cake at the Patisserie Akira Cake shop on Dec. 23, 2011, in Himeji, Japan. "The weather up in Hokkaido, which is the main dairy region in Japan, is getting very hot in the summer and extremely cold in the winter, so the cows are stressed, and they don't produce enough milk," Kurtenbach tells NPR's Audie Cornish on All Things Considered. "And on top of that, the average age of farmers is about 70 now, and not many young people want to do the work." Some cake shops in Japan have switched to margarine and other shortenings, but cake lovers are still left longing for the taste of butter, Kurtenbach says. "Traditionally the Japanese aren't big consumers of dairy products apart from, say, the elite," she says. "But when it comes to modern Japanese, they certainly eat a lot of Western food, they eat a lot of pastries and chocolates and cakes, and especially at Christmastime, not having enough butter on the shelves is kind of galling to many people." For more from the interview, click on the audio link above.